Anthony Crolla has no doubt he and Ricky Burns will deliver a better fight when they meet on October 7 than they would have done at any time in the past. A contest that has seemed close to happening on a number of occasions over the years has now finally been scheduled, with the pair set to do battle at lightweight at Manchester Arena. The clash has a definite must-win feel to it for both men as they each look to bounce back from unanimous points defeats in world title fights last time out. Mancunian Crolla (31-6-3, 13 KO wins), 30, failed to regain the WBA lightweight title in March as he lost his rematch with Jorge Linares. Thirty-four-year-old Scot Burns (41-6-1, 14 KO wins), who has held world titles in three weight divisions, then had the WBA light-welterweight crown taken from him by Julius Indongo the following month. Speaking on Tuesday at a press conference in Manchester, Crolla said: 'Ricky and I sparred together years ago - the last time was either 2009 or 2010. We've done quite a few rounds together. 'Since then we've both improved as fighters and have a lot more experience. There was talk of us fighting in 2011 but it'll be a better fight now. We're both more hungry and better than we have ever been. 'I look at every fight as a must-win, but certainly the winner of this one is almost guaranteed another world title shot. Burns, whose mutual respect with Crolla was clear at Tuesday's media event, also feels he still has plenty to offer. 'All I seem to be getting now from people is 'when are you going to retire?'' said Burns, a former WBO lightweight world champion. 'I still have another couple of years left in me. Nobody would know more than myself if it was time to call it a day. 'We're bringing in a dietician - we start with him next week. He will be keeping me on track and making sure the weight is coming down gradually and properly, so I don't see coming back down to lightweight as an issue. 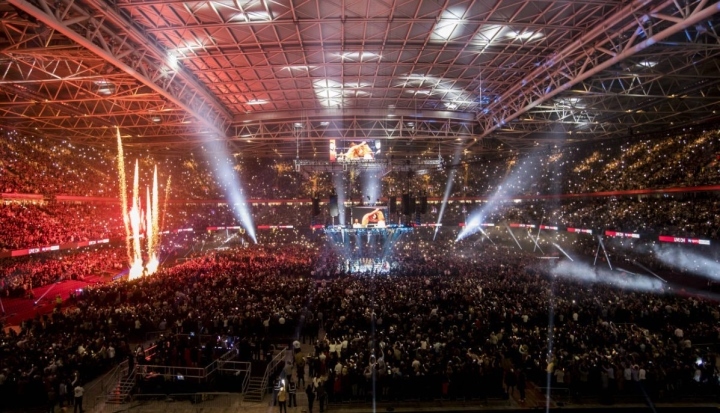 While it will be Burns' first time fighting at Manchester Arena, it is very much a home venue for Crolla, with eight of his last nine bouts having taken place there. The venue has remained closed since the terrorist attack there on May 22 which killed 22 people at an Ariana Grande concert. And Crolla said: 'It could be very emotional for some people - it could be their first night back in that arena since that horrible night. 'And every time I fight there it is special. He added: 'Las Vegas was on the table, an undercard against an opponent I'd be heavily favoured to beat, and Monaco, which would have been a nice away trip for the fans and an experience. Vs Flanagan? What's wrong with that? Both these guys make his resume look weak as water. Crolla is right. They won't put the winner in against a legit opponent/beltholder but will find a softy for a meaningless vacant alphabet belt. He's probably right, but that won't be because they're the most deserving of it, but rather because of Hearn's connections. Both of them are alright but I'm not really sure I'd rank either in the top 5 at lightweight. Neither of them beat's linares or garcia tho, The are both intrim champs, good enough to get a vacant title or from a poor opponent but never good enough to defend it against a true champ. Strongly disagree. If burns wins he'd be facing a guy who has already beaten him soundly. The winner needs another impressive victory to justify a world title shot.